Autumn has come late to my part of the world this year. Hardly any of the trees are bare yet. The leaves of the weeping cherry in our front yard have just started their transformation to yellow-gold. Ah, but the darkness has already made itself known; the sunlight is dying. Re is growing weak. Now is when He needs the magic of Isis. In the legend of Isis & Re, the Sun God has become so old that He drools, yet does not relinquish the throne to a more vital successor. So Isis fashions a holy cobra, molding it from the earth and from Re’s spittle, and places it in His path. The serpent, a symbol of His own weakness, bites Re. Re calls His magical children, the Goddesses and Gods, to His side to heal Him. 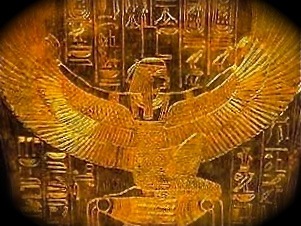 The Great Healer, Isis, can indeed heal Him, but only if Re reveals His true name. Long myth short, eventually He does and Isis does exactly as She promised: She heals and renews the God so that He may once more continue on His path through the sky. This is one of Isis’ key myths. It is not, as it may at first seem, a mean trick the Goddess pulls in order to gain Re’s power for Herself. (Please see my full explanation in Isis Magic; begin reading on page 61.) Rather, I believe that it is the remnant of an earlier myth in which it falls to Isis—the Goddess of Magic, the Goddess of Regeneration—to renew the Sun at His weakest point. Because Re wouldn’t or couldn’t recognize His own need for renewal, Isis had to bring that need to His attention. Once He makes Himself vulnerable to Isis by revealing His name and accepting Her help, Re is renewed and the world goes on as it should. As we see and feel the world slowly, if vividly and gorgeously, dying around us at this time of year, perhaps we are in need of the magic of Isis, too. Perhaps that is why we feel that thrilling little soupcon of fear around Halloween. We know in our bones the death of winter is coming. The creepies crawl up our spines. We sense that the veil between the worlds is thin and that someday we too shall pass beneath that veil into the otherworld. Perhaps that is why so many cultures have festivals of the dead at this time of year. Yet even as the year dies, as we acknowledge death and honor our dead, we must also—inevitably—invoke life and renewal. And so we have parties. We sing and dance in the night, take our little ones trick-or-treating, feast with our ancestors, and embrace the darkness with all the life and vigor we can muster. As Re called upon Isis to renew Him in His darkest hour, we, too, may call upon the magic of Isis to renew us in the darkening year. So I invite you, once the costumed kiddies have been tucked into bed for the night, to join me in the ritual of the Opening of the Ways. At the midpoint of the rite, with the Ways opened, whisper to Isis your secret name and ask Her to heal and renew you as we move into the dark part of the year. Radically open your heart to Her and let Her magic and love and power and wisdom flow into you, strengthening and renewing. Close the Ways and know that you are blessed. May you ever and always be renewed by the magic of Isis. Amma, Iset.